Oakley Guage 8 M sunglasses take a step forward in design and comfort for everyday performance beyond sports. The Gauge 8 M model offers a universally square aviator lens shape with a monoshock hinge to provide consumers with more flexibility and comfort. These Oakley sunglasses are constructed with Oakley’s C-5 frame material for efficient durability that offers a stress resistant and comfortable feeling. Unobtanium earsocks help increase sweat with perspiration to create a no slip grip without ruining the style of the Gauge 8 M sunglasses. Oakley’s Three Point Fit system provides a secure fit on your face, holding your lenses in an ideal spot. 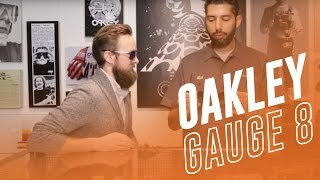 Need Oakley Gauge 8 M prescription sunglasses? We've got you covered with custom Rx lenses suitable to your vision needs.